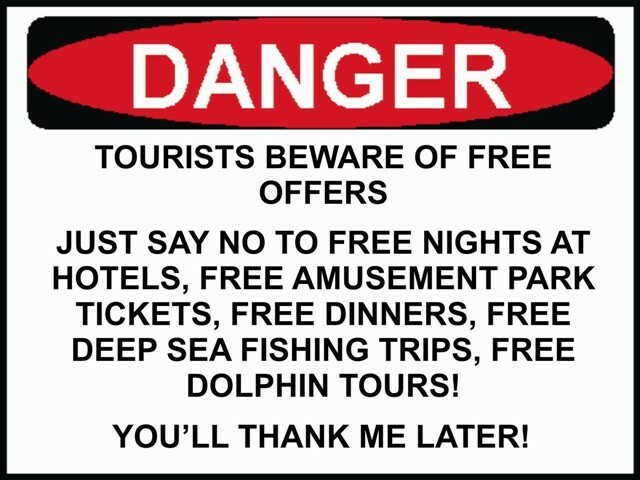 Tourist Nightmare ALERT – What I am about to describe is a pure tourist nightmare, and consider this a warning. We stopped by a “visitor center” that was actually a disguise for a rental property company that lures you into listening to their sales pitch for “90 minutes,” as the try to entice you to by into a “time-share-type” of plan that would enable you to stay at any resort within their catalog. I did not want anything to do with going to this meeting, but they promised us $100/couple for listening to the plan. We took it with the intention of being able to put the money toward a deep-sea fishing trip for Nathan, Katelyn, and my in-laws. MISTAKE! The whole presentation wound up taking almost 3 hours, the didn’t want to give us the $100 when we were explicitly told that’s what we would get. Actually, if you figure, we should have been given $200/couple since they took 3 hours of our time instead of the promised 90 minutes. The guy would just not take no for an answer. Finally, Shannon had to get out-right rude, as did I, to get him to just cut us a check and let us go! We weren’t even interested in the plan, we just wanted the cash. I know this guy had to make his living too, and he did a great job of explaining the plan, but honestly, how many times, and how many different ways can you tell a guy NO? FYI the name of the property group was Spinnaker.